Stay on top or your tax obligations. As I write this in mid- November the Johnson Controls – Tyco merger has happened as well as the Adient spin-off. By the time the newsletter gets into print and in your hands it may well be almost January 2017. If you kept some of your JCI stock through this interesting period we now have; some new JCI plc stock, some cash, and some Adient stock. The information put out by the company says that both the cash and the Adient stock may be treated as dividends while the JCI plc shares are probably taxed as capital gains. Several of you, that I’ve spoken to, have sold most (or all) of your JCI holdings before the merger. So the tax consequences of that choice are in the capital gain area. Other retirees either had no JCI stock, or it’s all within a 401k or IRA, so they have little reason to be concerned about the tax consequences. 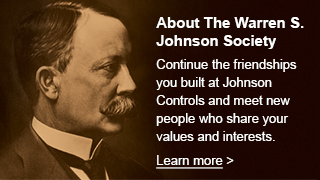 Now that Johnson Controls is a new company – How does it affect our Warren S. Johnson Society and the retirees that make it up? Since we are primarily a group organized to continue the friendships formed in our working years at the Company as we knew it, there should not be much of a change due to which current customers the Company chooses to focus on, or with what set of products and services. However, our blended family of retirees has just changed as business groups are added or split off. Perhaps there are other retiree groups (officially or spontaneous) that we could team up with to serve all better. Or maybe we could help facilitate a group that shares a common location, interest, business type, or vintage of their career, that could reconnect with our help or capabilities. You can help that happen by exploring the topic of “maintaining prior career friendships” with others in our newly Blended Family that you know or meet. Pass our contact information (WSJSociety.com) to them and/or send theirs to us. I have a cousin-in –law that works for Tyco, a neighbor retired from our Battery Group, and a few church members that worked for JCI. I think I’ll ask them the next time our paths cross.